Sterling silver cross necklace, "Cross of Life"
Francisco Sánchez creates a beautiful cross, taking the style of the traditional tree of life. Representing a union between life on earth and heaven, they are an exquisite manifestation of Mexican folk art. Francisco Sánchez brings his own interpretation to the design, executed in silver. He presents the pendant on a sterling chain. You can find sterling silver cross necklace 'Cross of Life' by Francisco Sanchez in jewelry categories such as Cross Necklaces, No Stone Necklaces, Sterling Silver Necklaces and Pendant Necklaces. Enjoy exploring these sections for other Novica treasures. "love style and artist's work"
If this had a much longer chain it would be perfect. I rarely wear it because it just doesn't look right so high on the chest. "Great quality and heavy weight"
This is a beautiful sturdy piece. Sometimes pieces with this level of detail can be flimsy and easily damaged, but this will not. I love the theme of the union of heaven and earth. If you think you would like this necklace, you probably will love it--- it is even better than pictured here. lovely gift for someone, or yourself! 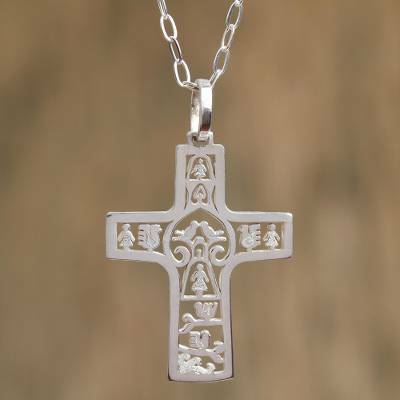 "Striking folk art in silver"
I adore this beautiful cross! It was slightly bigger than I expected, and the details are fantastic! I love to wear it on religious occasions, as it is so unique and so different from "typical" crosses. The chain is also very nice. Neither the chain nor the cross have tarnished at all, so they are very easy to care for. I also ordered one as a gift for a friend, she loved it! I love this cross pendant and chain. So unique. The silver is bright and shiny. One of my favourite pieces.